Given that this roof has worked OK our son is considering doing repairs on it for a few more years rather than replacing it with slate or dare I mention it, asphalt, at this time. The other side is a lot better and on the "bad" side there have been several new slates over the years (see new pic) and we ourselves have a stock of Bangor slates we had to take off our own house's too low slope porch. The ridge slates have definitely come apart in places - you can see daylight and there is a small spot of water on the boards on the attic floor. We have a good relatively inexpensive slate roofer but we need to tell him what to do as he was going to put tar on the ridge to seal it up. I assume that is a NO No? Short of putting a metal ridge cap over the tiles or taking them off and redoing it can you, as I think I read in my SR bible, slip some metal flashing into the worst areas? Any suggestions much appreciated. Its unfortunate that they would build the eave with no overhang. You may have to rely on some type of active ventilation if there is no entry point. To make your gable vent work you would need two so that the air flows thought the attic area. That goes with all venting you need air to come in then go out, so if you go with a eave vent you should install a rigde vent. This will let air in then let the hot air out at the rigde. You could also install two gable or half round vent made from copper, one each side of the roof. Alot like a galbe vent but made to be flashed in with the new slate roof. Thanks Joe. Having read a bit more I realize that our problem is not how to remove the hot air but how to provide intake air for this process to work. Our slate roof has no overhang so no place for soffit vents and our one gable vent does not cut it being too small in area and high up. 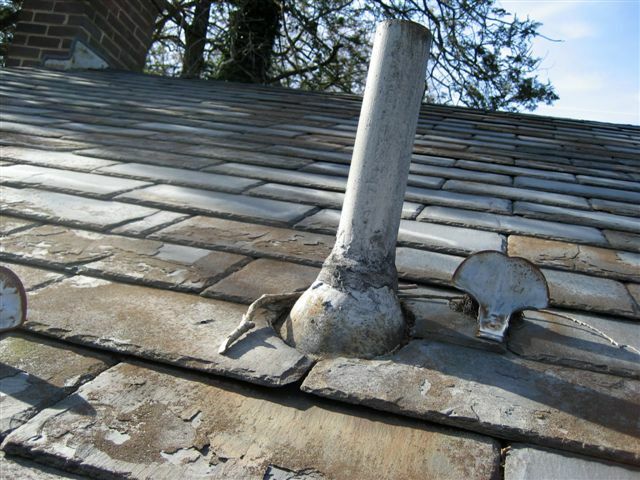 Have you used the drip line vent or Smart vents which I gather are put into the low part of the roof deck to provide intake air for slate roofs? Thanks again for your time. You can install either low-profile roof vents or else electric fan-operated roof vents. Thanks Joe. That is the side that gets the most sun although the house is not positioned straight north/south but this side's slate is worse. What would you suggest doing to vent a new slate roof? There is one gable vent and there is no possibility of another as there is a chimney breast the other side of the house. (Does that vent do anything?) The small space gets very very hot and it seems the time to think about that and do venting if possible. The floor of the attic is insulated from the bedroom area below but I don't think there is any insulation between the roof rafters. Looking down their street no-one has done any additional venting but that may only reflect the fact that most roofers don't know much about venting. Thanks for any additional help. Looks like it's reaching the end of its life, although the north side tends to last longer than the south (assuming you have that orientation), and I can't tell what side this is. If it's the north side and the slates are crumbling like that, then the south side must be really bad. 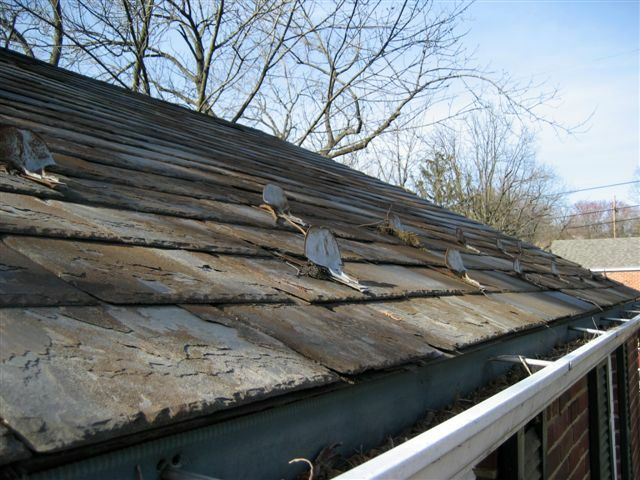 On the other hand, you can replace the worst slates and baby the roof along for possibly years. I have seen old black PA slate roofs that hung on for 20 years after I would have given up on them. 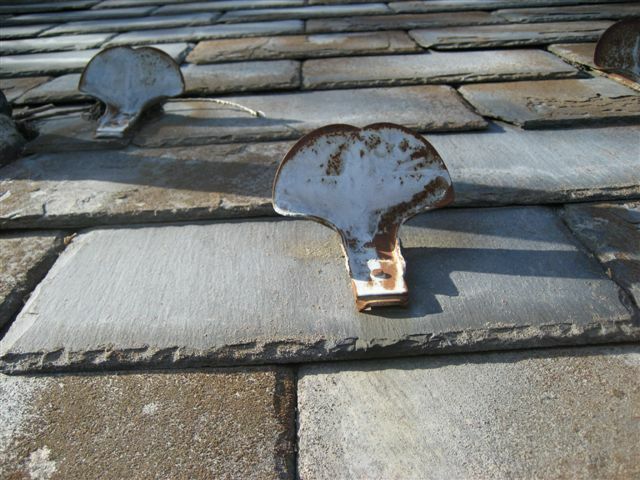 Every year a number of slates had to be replaced until the annual cost got to be too much, then the roof was removed. The low slope doesn't help at all - people can walk on it and damage it, plus low slope roofs just wear out faster. Looks like an easy roof to slate, however. If you reslate it, use VT slates and a 4" headlap. Maybe more headlap along the eaves. I would like advice from the experts on two things: does this slate roof need replacing and if so advice on the constuction of the replacement. I am attaching pictures of the roof both from the ground and from a ladder. Both our son and we have Bangor slate roofs (DC area). Our slate roofer is always telling us how soft ours is but we say just go on maintaining it which means replacing a slate or two each year so not a big deal. Our son's roof on a much smaller brick house built in 1941 is another issue and perhaps in his case it should be replaced. We cannot rely only on our roofer as although he is a very skilled and conscientious roofer (my husband worked in England as a student with a slate roofer in the summers so knows a bit)he tells all of our street the same thing about our slate roofs (maybe he is right but roofers generally prefer asphalt it seems). Back to son's roof. It does not appear to be leaking as far as we can see (the attic is enclosed with a trap door and very low so you can't stand and it is dark) but our son is concerned because he can see daylight from the ridge area and when he told the roofer he said that he could "caulk up" the ridge but that it was not worth doing anything more (laying a new ridge?) as the roof was soft at least on the sunny back side of the house (see pics). 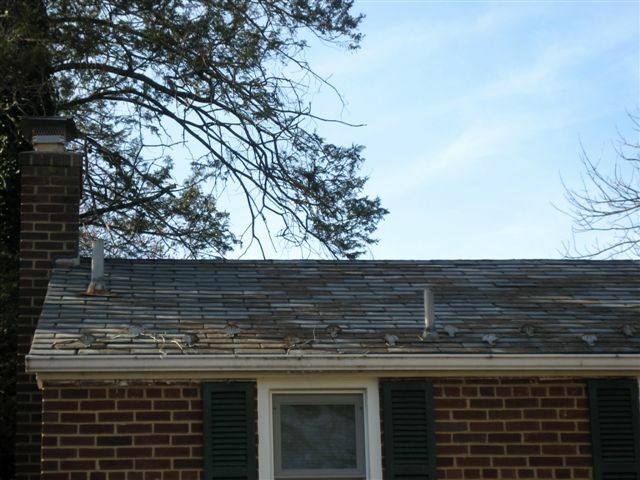 So we would very much appreciate help in making the decision of whether to re roof (it would probably be asphalt shingles for budget considerations). The issue then would be whether to do any additional ventilation at that time. Currently there is a gable vent at the non-chimney end of the brick house but the roof does not overlap so no room for soffit vents to go with a ridge vent. We are concerned that with the increased air tightness of an asphalt shingle roof this small space which is already very hot in the summer would be insufferable to access except in winter which wouldn't be such a big deal as it is only used for storage of boxes. Thanks for reading.